Review Summary: Keshu (Anand Tiwari) a student in a small town in Bihar is hardly interested in the routine business of life. He hangs out with his odd medley of friends and thinks of innovative ways to add spark to their lives. Check this out: phirang girl comes to small town. : Keshu (Anand Tiwari) a student in a small town in Bihar is hardly interested in the routine business of life. He hangs out with his odd medley of friends and thinks of innovative ways to add spark to their lives. The full name of the movie is 'Jo Doob Gaya So Paar... Its Love In Bihar'; long name but a short story of love which came from a sweet little intent coming from a cute little idea which could have gone places. But alas, the short sightedness of the maker Praveen Kumar results in the viewer asking themselves Where was the love and was it in Bihar? 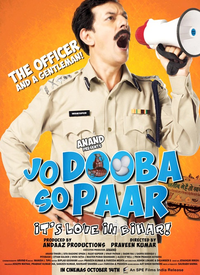 Jo Dooba So Paar will go down in box-office history as a non-starter because it has taken a very dull start and there's nothing in it to warrant a pickup. Jo Dooba So Paar doesn't get the audience's attention too far. Half-baked and badly shot the film is best avoided.